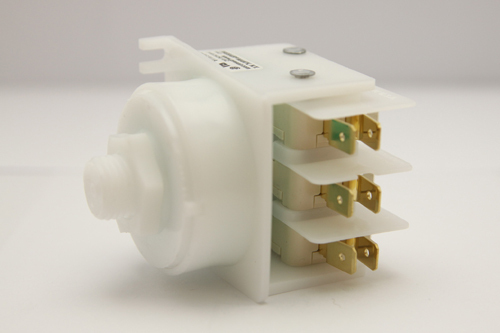 Additional Description: MRG311A Magictrol Air Switch. Four function air switch with blue cam. 21 Amps, 3PDT air switch. In Stock. Direct from USA Manufacturer. The Magictrol Air Switch is used to sequentially switch up to four separate pieces of equipment. Each time an air pulse is applied, a stepping cam is rotated through four positions, actuating a combination of two or three microswitches. Magictrol switches can be used up to 15 feet away from actuator or foot pedal. Distances of 100 feet away can be reached with solenoid and momentary air switch.